Crinkle cookies are pretty, but don’t always live up to my taste expectations. They’re either too sweet, not flavorful enough or lack chocolate. I’d pretty much given up on them until this weekend when Louise turned me on to an old recipe from Gourmet – a crinkle cookie with a kick of Sambuca. I’ve tasted Sambuca only once in my life, but Ouzo is another story. In fact, I had a whole bottle of it in the cabinet. Thinking I could swap it out for the Sambuca, I made the cookies with Ouzo and extra bittersweet (72%) chocolate. They were chocolaty alright, but not sweet enough and neither spread nor crinkle. After debating whether or not to run out and buy Sambuca, I decided to stick with Ouzo and add a little sugar. That did the trick. I also experimented with different kinds of chocolate (53% cacao vs. 72% cacao) and found the 53% worked much better. The cookies spread and crinkled, whereas with the 72%, they just held their shape. Another test I did was with/without walnuts. I love walnuts, but these cookies were much better without them. So the final version of the recipe was something like this. The only change I might make or experiment with is the addition of miniature chocolate chips. Mix together the flour, baking powder, and salt and set aside. Melt chocolate with butter in a metal bowl set over a saucepan of simmering water, stirring until smooth. Alternatively, you could do this in the microwave. Whisk together eggs, Sambuca (or Ouzo), and granulated sugar in another bowl. Stir in flour mixture and chocolate. At this point the dough will be too thin to shape. Chill, covered, until firm, about 2 hours. Sift confectioners sugar onto a plate. Roll heaping tablespoons of dough into balls and roll balls in sugar to **generously** coat. Arrange balls 2 inches apart on greased or parchment lined baking sheets and bake one sheet at a time OR in upper and lower thirds of oven, switching position of sheets halfway through baking, until puffed and cracked but centers are still a bit soft, 10 to 12 minutes total. Transfer to racks to cool. My (German Polish) family traditionally eats sugar cookies with anise-flavored frosting for Christmas. I will definitely add these to the menu! For those with more conventional palates, perhaps Frangelico or Disaronno? This recipe sounds like something my mother would love – anise and chocolate! I’m wondering if anise extract could be substituted for the Sambuca or Ouzo (obviously not a 1/2 cup, say 1 – 2 teaspoons). Would the flavor be the same? I have some sambuca to use up so these would be perfect – thanks! Sambuca in a cookie recipe…. how unique! I’m saving this one for after the holidays. Maybe for Valentine’s day! I’ve never had Sambuca and have only tasted Ouzo once at a party in college. I was very leery of it because of the particular party it was served at. 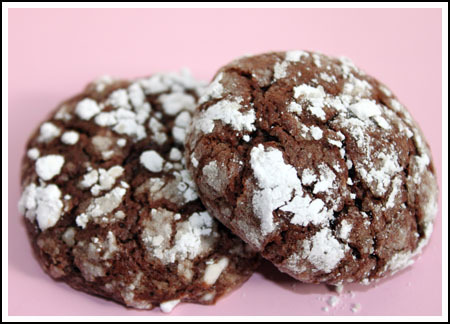 Chocolate crinkle cookies with either of those additions sound very interesting indeed! Anna, thanks for your experimentation. I had no idea that cacao content affected cookie structure, but I guess it makes sense, considering that cacao works as a flour and the higher the number, the more content (flour). This recipe looks great. I have a small sample of Sambuca in my pantry, so I’m printing this one out and adding it to my ever-growing list of cookies to be made. Very Merry Christmas to you and your family.